The whine of a pulse gun sounded in the wood; she ducked and the shot flew over her head, obliterating the trunk of a beech tree in front of her. Panic rose in her throat. They weren’t just out to destroy the monster. They were going to kill her too. She kept running, her feet slipping inside the blue plastic overshoes she hadn’t had time to remove before bolting from the lab. She’d known this day would come – she’d crossed the line so far, it was no longer even a mark on the horizon. But she still hadn’t been ready. How could you ever be ready to lose what you’d been working on your entire life? The creature vibrated against her chest, a red light pulsing against its hot metal skin like a heartbeat. It wriggled in her arms, trying to escape – as if it too knew what was coming – but she tightened her grip. She just had to make it to the other side of the ravine, to the emergency car that would take them to safety. The next shot hit her shoulder and she wasn’t sure who screamed louder: her, or the creature. She stumbled, one leg collapsing underneath her as her foot sank into a crevice hidden by a carpet of fallen leaves. She dared to glimpse down and her heart almost stopped: the creature’s metal body was smoking, the acrid stench of burnt electronics filling her nostrils. The pulse guns were doing their job, destroying it from the inside out. She pulled her foot free and pressed on. The bridge was so close she could feel the rumble of trains as they passed underneath. Yet the heavy booted steps of the men behind her were louder still. ‘Come on, come on,’ said the voice crackling in her ear. She must have come into range of her partner’s communication device. She forced her legs to pump harder, ignoring the sticky wet stab of pain in her side . . .
‘Cutting comms, link destruction in process.’ Almost as an afterthought, he added, ‘Sorry.’ And then the line went dead. Another pulse thumped her in the back, launching her forward and sending the monster flying from her arms. She had no choice but to watch as the smoking hunk of metal disappeared off the side of the bridge. Her assailants ran past her now, flinging themselves at the railing, leaning out over the edge and watching the blaze of sparks sent up as the metal monster hit the electrified track. It was gone. Her life’s work: destroyed. The men turned back to her, gun barrels levelling at her head. She closed her eyes and accepted the inevitable. Down on the tracks below, the monster shuddered with one final pulse of life. As a train thundered down the tracks towards it, it only had the energy for the faintest sound. HOW INCREDIBLE DOES THAT SOUND?! . 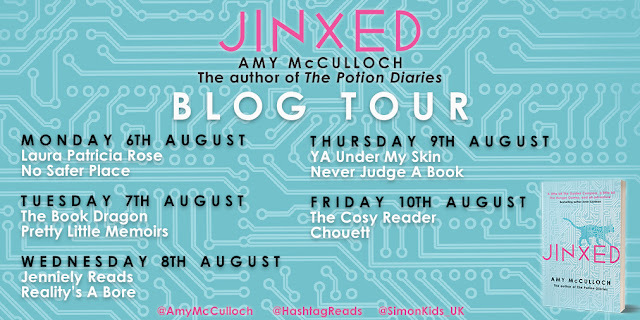 . .
Amy McCulloch is the author of The Potion Diaries series (under the name Amy Alward) which has sold in eight languages around the world and was a Zoella Book Club pick in 2016. 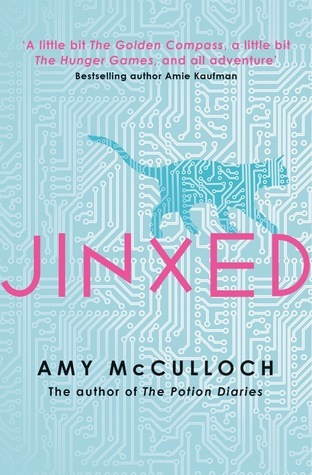 Her current sci-fi series, JINXED, is out from Simon & Schuster UK in August 2018. Before becoming a full-time writer and freelance editor, Amy was editorial director for Penguin Random House Children’s Books, where she worked with many YA and MG authors and published the #1 international bestseller GIRL ONLINE by Youtube sensation Zoe Sugg, and its follow-ups GIRL ONLINE: ON TOUR & GIRL ONLINE: GOING SOLO. Previously she was also commissioning editor for HarperVoyager, where she worked with some of the top SF&F authors in the world. 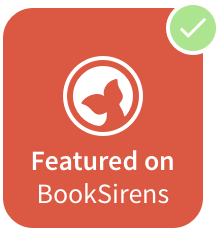 In 2013, she was named one of The Bookseller’s Rising Stars of publishing. An adrenaline junkie with a love of adventure travel, she’s never in the same place for long. Other addictions include coffee, ramen and really great books. 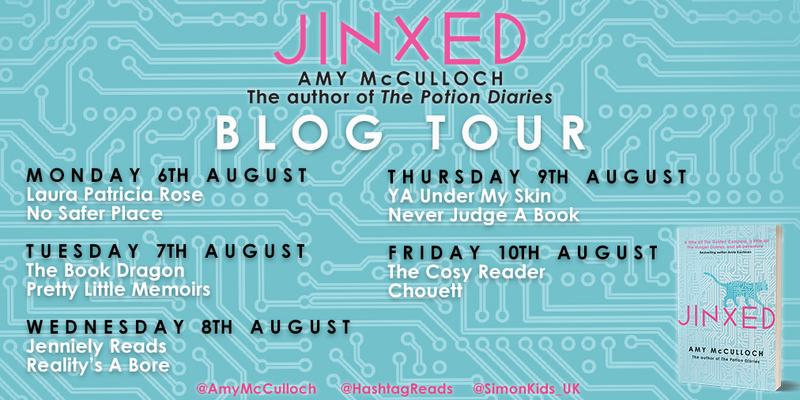 You can follow Amy here and add JINXED to your Goodreads here! Have you heard of JINXED? What intrigues you most about it? For me, it's partially that cat on the cover (obviously) and that fast-paced "what will happen next" feeling I get reading the extract! 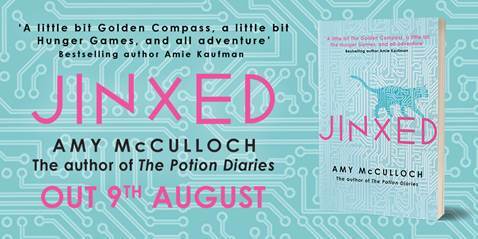 JINXED is out August 9th - don't miss this firecracker read!